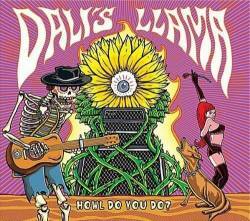 Dali’s Llama - "Howl do you do?" So the husband and wife team of Erica and Zach and friends are back with their 9th CD and the first one ever in this style of music. As they write in the promo material, they really wanted to revisit the sounds and roots of the “Nuggets” era and brought along Mikael Jacobson (sounds like a Danish guy to me!) to play the 60’s style keyboards. While they are known for their desert-stoner rock sound, this is a brilliant change in style and I dug the CD a lot. The opening track will remind you of 13th Floor Elevators. Other influences on the faster tracks are the Sonics (they also mention this). My favourite track was track 10, Plaid Retina, where the band really space out and jam. Very cool song. There is no track 11 but track 12 is a cool slow steel guitar acoustic blues track called Graveyard Blues. Great way to end this very cool CD. Highly recommended.